Love this free look at analytics for prospects in the 2020 and 2021 draft classes? Check out our premium look at the Top 100 Draft-Eligible Pitchers! As scouts build their future draft lists, the analytics department for each front office will send it’s area scouts a list of stat-based follows. In many instances, the names on this list will match those already on a scout’s personal follow list. In other instances, names on the stat-based list may be new to a scout, prompting the scout to get out and take a look at the office’s recommendations. We have approached the analytics process in similar fashion—to identify possible under the radar prospects. We have broken down pitching into three categories: Zone Control, Pitch Ability, and Durability. Zone Control is how well the pitcher controls the strike zone with strikeouts, walks, wild pitches and hit by pitch. Pitch Ability refers to the pitcher’s ability to pitch and uses statistics like WHIP, FIP and OppSLG. 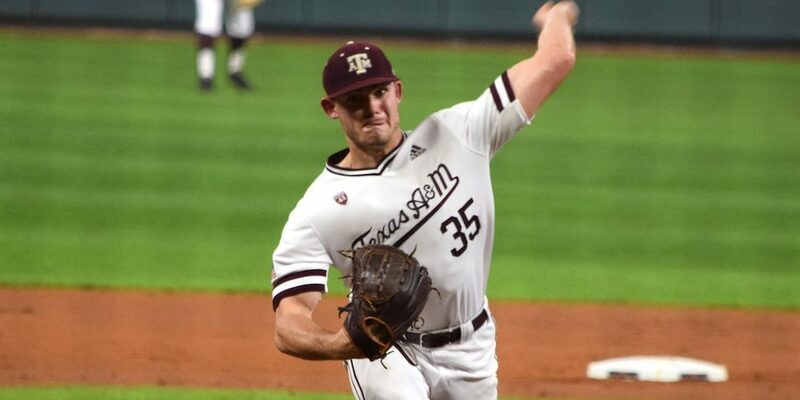 Durability is largely based on innings pitched as college starting pitchers have shown greater success in professional baseball than college relievers. Adjustments have been made to account for park effects of the most extreme hitter and pitcher friendly parks, as well as an adjustment for a team’s strength of schedule. Our analysis is based on statistics only and does not consider how a pitcher fields his position or holds base runners. Nor does it consider a pitcher’s athleticism, arm action, delivery, projection or any other in-person scouted qualities. It is simply a list to identify pitchers who have statistically performed in areas that are proven to correlate into professional baseball. Pitchers are graded from 100-50.